Once you push that pretty new website out into the world, your job is done, right? The client has a new website and… a million questions. It’s not your job to be doing all this training… right? But you feel bad, so you offer support for two weeks, maybe a month, but you feel resentful the first few times. After a couple rounds of this happening, you put a support clause in your contract, and bump your price a bit to cover it. But it’s still frustrating to answer the same questions over and over and not be able to focus on your new clients, because you’re still working with your old ones. Or worse, maybe you’re one of the web designers who just dumps a new website on their client, then slams the door in their face. Not cool. Just because you know how their website works, doesn’t mean your clients do! Leaving your clients feeling lost at the end of a project–or feeling resentful towards them for asking questions is not a good note to end on. Which is why you need to make your clients a goodbye packet. What is a goodbye packet? When you’re wrapping up a project, it’s necessary to let clients know what the next steps are, as well as assemble any tutorials, or pertinent information that the client will need in the future. A goodbye packet includes all of the important information your client needs to know for the foreseeable future, provides a clear ending to the project, and cuts down on support at the end of your projects. When do you send a goodbye packet? A goodbye packet is designed to be sent AFTER you launch a website and hand the keys over to the client. Because the goodbye packet allows the client access and instructions to edit their website, you should not send it until you are completely finished with work. How is a goodbye packet different from a welcome packet (or intro packet)? Is all about the client—not you! While intro and welcome packets are all about what you need from the client and how you will work together, a goodbye packet is really about the client and the project and making the next steps easier. A goodbye packet should include basic information that doesn’t change from like-project to like-project. For example, if you’re a web designer, you may have a variety of types of websites that you work on, but overall, the main processes your clients follow should be should be the same whether it’s a simple blog, or a large e-commerce site. If you offer multiple services that have different processes (e.g. you offer both web design and consulting services) you’ll need to make goodbye packet for each service, but keep things simple by re-using information whenever possible. Unlike intro or welcome packets, goodbye packets have customized sections for each client. Why are goodbye packets customized? The intro packets and welcome packets are used as an introduction to working with you, and the project as a whole. While you could customize the intro and welcome packets to each client, the point of them is primarily to streamline your processes and convey important information to the client for the duration of the project. After reading those documents once or twice, clients likely never return to them. But goodbye packets, while they help streamline the website handoff, exist as a tool that your client is likely to reference again and again. Not only does some of the information included change based on the individual client, but the personalization of a goodbye packet makes it an extension of your product. 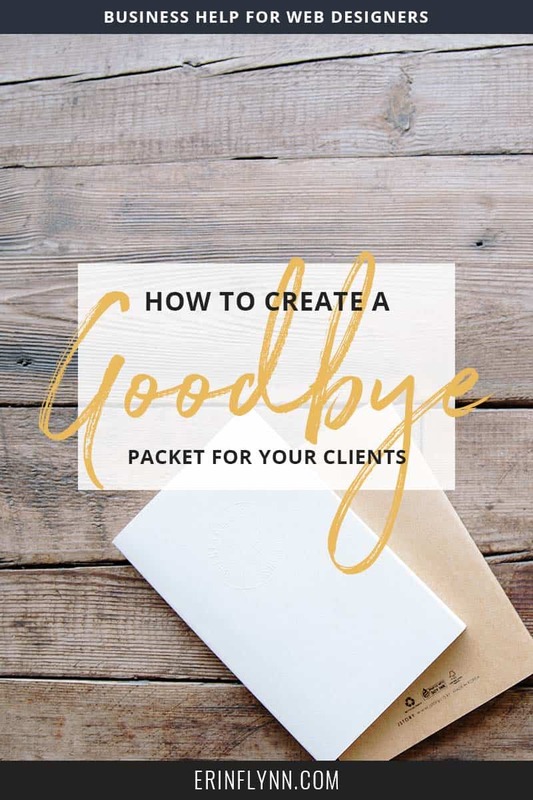 This means many clients see the goodbye packet as a bonus gift that you are giving them. These different sections are broken-down in-depth (with copy+paste sections) in Streamline Design Profit, but overall they provide information to the client about using their new website, how to login to their website, and how to make appropriate changes to the website. You’ll also want to cover any frequent questions you get from clients, and make clients aware of any additional services you offer, so that you can keep them coming back. Goodbye packets don’t just make things easier for you by answering questions and providing training, they make things easier for the client. Instead of having to email you about every question they have, they have a resource that they can reference and get their answers easily. Goodbye packets reduce your support workload, and make your clients happy. Which makes you happy. Which means projects end on a good note and clients are more likely to refer you, or come back for more work–and you’ll be happy for the return! So go get started on your goodbye packet now! Want to learn more about goodbye packets? I teach you how to create your own goodbye packet, start to finish, and in-depth in my program, Streamline Design Profit.